This data set reports the measurement of stable carbon, nitrogen, and oxygen isotope ratios in organic material (plant, litter and soil samples) in forest canopy profiles and pasture (grasses and shrubs) as well as corresponding carbon and nitrogen tissue concentrations in a number of different sites across Brazil. The sampling design captured the temporal variation in rainfall from 1999-2004. Carbon and nitrogen isotope ratios can act as a proxy for interpreting aspects of the carbon and nitrogen cycles in Amazonian rainforests. Data are in three comma-delimited ASCII files. Figure 1. 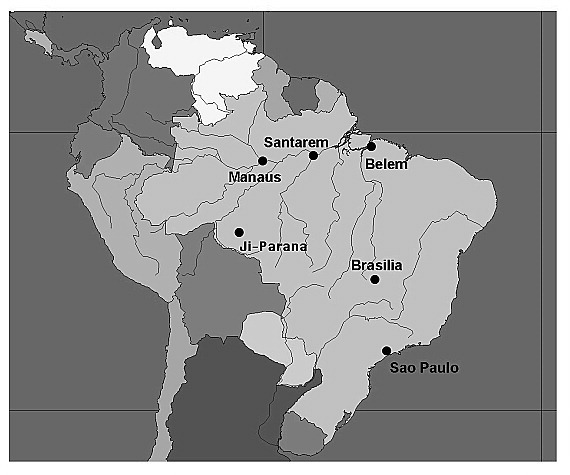 Map of Brazil and other countries in South America, with the locations of the cities (Santarém, Manaus, and Ji-Paraná) near the field sampling sites. This data set was archived in July 2010. Users who download the data between July 2010 and June 2015 must comply with the LBA Data and Publication Policy. Data users should use the Investigator contact information in this document to communicate with the data provider. Alternatively, the LBA Web Site [http://lbaeco-archive.ornl.gov/] in Brazil will have current contact information. The investigators were Cook, Craig; Domingues, Tomas Ferreira; Ehleringer, James; Flanagan, Lawrence; Martinelli, Luiz Antonio; Ometto, Jean Pierre H.B. ; Berry, Joseph and Nardoto, Gabriela Bielefeld . You may contact Ehleringer, Jim (ehleringer@biology.utah.edu) . This data set reports the measurement of stable carbon, nitrogen, and oxygen isotope ratios in organic material (plant, litter and soil samples) in forest canopy profiles and pasture (grasses and shrubs) as well as corresponding carbon and nitrogen tissue concentrations in a number of different sites across Brazil. Carbon and nitrogen isotope ratios can act as a proxy for interpreting aspects of the carbon and nitrogen cycles in Amazonian rainforests. The objective was to measure carbon and nitrogen isotope ratios of organic material (plant, litter and soil organic matter) in forest canopy profiles and pasture (grasses and shrubs) as well as corresponding carbon and nitrogen tissue concentrations in a number of different sites. The sampling design captured the temporal variation in rainfall over the course of several years. No future modifications of these data are planned. Data are in three comma-delimited ASCII files. In all files 9999 is used to signify missing data points. In addition there are C and N concentrations and delta stable isotope values for wood and soil organic matter from the same 5 study sites. All data in this file was collected between January 2002 and October 2003. The data set covers the period 1999/03/01 to 2004/08/31. Tropical forests play a central role in the global carbon cycle and improving our understanding of the factors that influence net carbon gain or loss in these ecosystems will improve our understanding of the global carbon cycle. Carbon isotope ratio analyses of plant materials can provide insight into carbon cycle dynamics by providing a quantitative assessment of stomatal limitations to photosynthesis (Farquhar et al. 1989, Ehleringer and Monson 1993) . Variations in the delta 13C of leaves in tropical forests are strongly correlated with position in the canopy profile with lighter foliar delta 13C (more negative) values found in the understory as compared to the canopy (Medina and Minchin 1980, Ehleringer et al. 1986). Variations in delta 13C values between sites may be driven by differences in forest stand structure and resulting effects on light availability and vapor pressure deficit. Nitrogen isotope ratios provide information about N cycling within ecosystems (Hogberg 1990, Evans and Ehleringer 1993, Martinelli et al. 1999 and many more). Foliar and soil delta 15N patterns in tropical forests have been shown to be elevated relative to values in temperate forests (Martinelli et al. 1999). This pattern may be a result of gaseous N losses associated with microbial metabolism (Austin and Vitousek 1998) or the abundance of leguminous trees and their associated N fixing abilities in tropical forests. Both N and C isotopes and the variability in delta values within and across sites may be used as a proxy for interpreting aspects of the C and N cycles in Amazonian rainforests. Stable isotope ratios of carbon and nitrogen were measured relative to international recognized standards. Internal working standards (Atropine and soil standard no. 502-308 from LECO Corporation) were included in every run, as regular laboratory procedure. The precision of measurements was plus or minus 0.3 %, 0.1 %, 0.25 per mil and 0.35 per mil for C, N, delta 13C and delta 15N, respectively. Precision for P and Ca analyzes were Ca (3%) and P (<1%). Leaf samples were collected from plants along a height profile through the canopy at all sites during each study period. Three samples of leaf litter were randomly collected from each study site during each sample trip. All samples were oven-dried at 65 degrees C until constant weight and then ground to a fine powder. Soil samples were air-dried, sieved using a 2-mm mesh and homogenized. A smaller sub-sample was taken, handpicked to remove fine roots and other debris and then pounded. A 1.5-2 mg sub-sample of ground material or 15-20 mg sub-sample of pounded soil were placed and sealed in a tin capsule and loaded into a ThermoQuest-Finnigan Delta Plus isotope ratio mass spectrometer (Finnigan-MAT; CA, USA) in line with an Elemental Analyzer (Carla Erba model 1110; Milan, Italy) at the Laboratory of Isotope Ecology (CENA-USP, Brazil). From these analyzes we obtained both isotope ratio (delta 13C and delta 15N and in a limited number of cases delta 18O from cellulose) as well as tissue elemental content (C and N). Foliar Ca and P concentrations were determined after a tissue digestion with nitric acid + perchloric acid (5:1). P concentrations were determined using color spectrophotometry, Ca concentrations were determined using Atomic Absorption spectrophotometry with the addition of 0.25% Lanthanum oxide solution (to avoid Al interference). Austin, A and PM Vitousek. 1998. Nutrient dynamics on a precipitation gradient. Oecologia 113:519-529. Ehleringer, JR and RK Monson. 1993. Evolutionary and ecological aspects of photosynthetic pathway variation. Ann Rev. Ecol. Systemat. 24: 411-439. Farquhar, GD et al. 1989. Carbon isotope discrimination and photosynthesis. Ann. Rev. Plant Physiol. Plant Mol. Biol. 40: 503-537. Hogberg, P. 1990. 15N natural abundance as a possible marker of the ectomycorrhizal habit of trees in mixed African woodlands. New Phytol. 115: 483-486. Martinelli, LA et al. 1999. Nitrogen stable isotopic composition of leaves and soil: tropical vs. temperate forests. Biogeochemistry 46:45-65. Medina, E. and P. Minchin. 1980. Stratification of delta 13C values of leaves in Amazonian rainforests. Oecologia 45: 355-378. Ometto, J.P.H.B., L.B. Flanagan, L.A. Martinelli, M.Z. Moreira, N. Higuchi, and J.R. Ehleringer. (2002) Carbon isotope discrimination in forest and pasture ecosystems of the Amazon Basin, Brazil. Global Biogeochemical Cycles 16(4):1109, doi:10.1029/2001GB001462. Ometto, J.P.H., L.B. Flanagan, L.A. Martinelli, and J.R. Ehleringer. (2005) Oxygen isotope ratios of waters and respired CO2 in Amazonian forest and pasture ecosystems. Ecological Applications 15(1):58-70. Ometto, J.P.H.B., J.R. Ehleringer, T.F. Domingues, J.A. Berry, F.Y. Ishida, E. Mazzi, N. Higuchi, L.B. Flanagan, G.B. Nardoto, and L.A. Martinelli. 2006. The stable carbon and nitrogen isotopic composition of vegetation in tropical forests of the Amazon Basin, Brazil. Biogeochemistry 79(1-2):251-274.